With Valentine’s Day on the horizon, it was a nice number at the club this week. 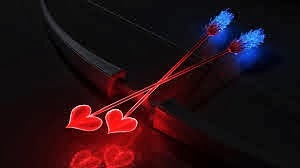 Plenty of earlybirds and then, two members who had clearly concocted late arrivals to enable their relationship to blossom in peace. Much more on that later. Time for some digression before Jon, GarethII, Paul, Tom, Amanda, Philip, Andy and me get on to gaming. Well, well, well… six weeks into the New Year and my curb on buying games is going ok IMHO. James threw me an early curve-ball in the form of an original, Japanese, Machi Koro, but resist I did. After all I’d already picked up Rokoko from him: too cheap to turn down! The wishlist meanwhile, is growing, exponentially. So, yes, I did get suckered in by the Livestock Uprising ks mentioned last week, and yes I bought the company’s first release, ‘LakeBilly’ an age 21+ (!!) card game of you buying a boat to get folk across the lake to a bbq/party, currency is beer, hurrah! Still it wasn’t too much - £15 - and no customs charge to add thankfully. I’ve backed the expansion to City of Iron and that was paid for yesterday. Amazingly, that’s it for Kickstarter for now. Nothing else on the horizon, which is great news for the loft. Although, saying that, there are three done and dusted, just waiting production but not due until May, June and September respectively. January did see a few boxes enter the Horahouse I will admit. I’d added a few to the wishlist following Rahdo’s recent videos of ‘underrated’ games and Joel Eddy’s ‘running through the shelves’ video [sorry can't find the link right now, might be part of his games of 2013 vid]. And then some geek spots that someone’s selling one of them on Amazon for £14 inc postage, not seen it under £26.99 so that was too good to be true. So, my second ever space-themed game, whizzed its way, by mini-van, into my life; Star Trek Expeditions (Reiner Knizia no less), and I have to say the minis are nice. 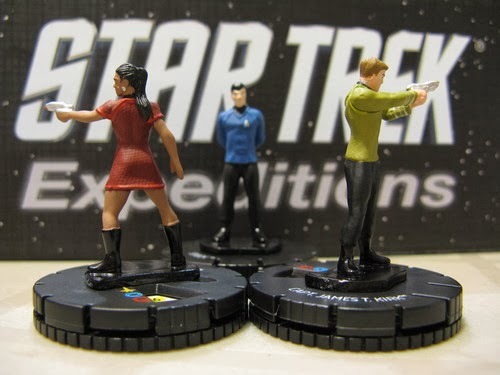 But hell if it doesn’t have an expansion, with three additional character figures; Scotty, Sulu, and Checkov. Bought. Oh, and I ordered Franz-Benno Delonge’s ‘Manila’. 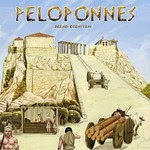 I think I’ll like his games – famous last words - and so have several; Container, Hellas, Dos Rios, but have yet to play any of them: how the hell does that work? Same old, same old… anyway, on the Geek someone had spotted a Chinese site DHgate which was selling the game for £24 delivered. Hell, it’s €42 new on the marketplace for starters. I checked the forum and all who’d ordered had received so took the plunge on that too. And just to make sure I was getting some gaming fix at the start of the year I bought some new cotton baggies and have some more BGG store promos coming for Nations, China and Triassic Terror. Did I mention I bought China having enjoyed it so much at Tom’s? No, well I did, and obviously it’s difficult to buy just one game at a time so I picked up the Alien Artefacts expansion for Race for the Galaxy! Honestly, that’s it to date. The two other pre-orders don’t count. Not at all. 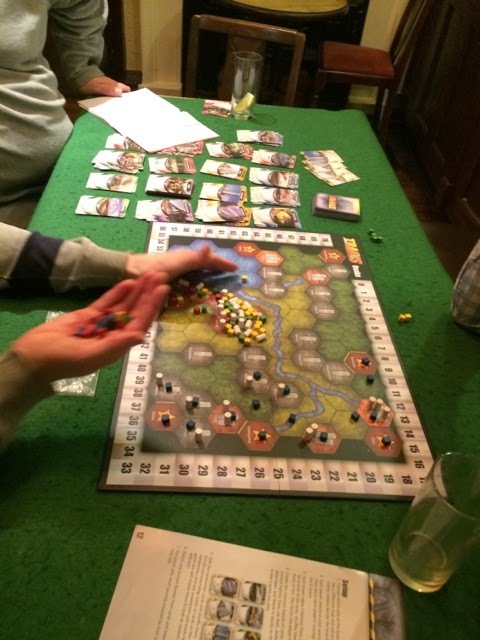 Gareth was the lone early bird this week, until Jon showed up, so they had a quick game of this Knizia classic. This was incredibly close, going to the last card drawn from the deck, with Jon failing to find the Blue 5 that he needed and so Gareth was able to claim the final flag for a 5-4 victory. This is the ultimate 'I've got 7 cards in my hand and I don't want to play any of them!' game. Good fun. Next up for Jon and Gareth was stiff competition from Paul and Neil in this very popular filler, can’t believe James gave it away, generosity knows no bounds, as the cliché goes! Rules were explained to Gareth and off we went, seven rounds of gambling, bluffing and the odd piece of fortune. With Paul starting a cagey first round saw Jon picking up a useful 10 points or so. Going first has some advantages if you can set yourself up to collect a reasonable return. So I did in the next round, but Jon again capitalised pretty well. Gareth played an interesting set of braves blocking all three totems and saw off a variety of cards. And then Jon took another useful set, how was this happening? With the start player coming back around neither Paul or I managed to collect anything significant. Jon on the other hand picked up a wonderfully tall totem and it was game over to be honest. Final Scores; Jon – 72, Neil – 50, Paul – 44, Gareth II – 36. As we were still waiting for James and Dan to arrive, we decided to go for something that wouldn’t take too long, and Trains was a nice precursor to the meatier Railways of the World which was being eyed up by Andy and Philip. The starting places showed the Philip would be in the West, Andy in the South, Neil in the East and Paul in the middle. Andy started off by buying an express train and declining to build anything as he didn’t want to accumulate any waste. Neil started to spread North and South from his lonely spot far away from the others. Paul copied Andy. Philip copied Neil. As the game progressed, Neil was still on his own and was able to spread his wings without any impediment. Paul came South into Andy’s territory and West into Philips patch. He’d bought a very expensive subway excavation card to let him do this on the cheap. Philip pushed back at Paul, as he’d bought several subway excavations and near to the end they both had almost exactly the same placements on the board. 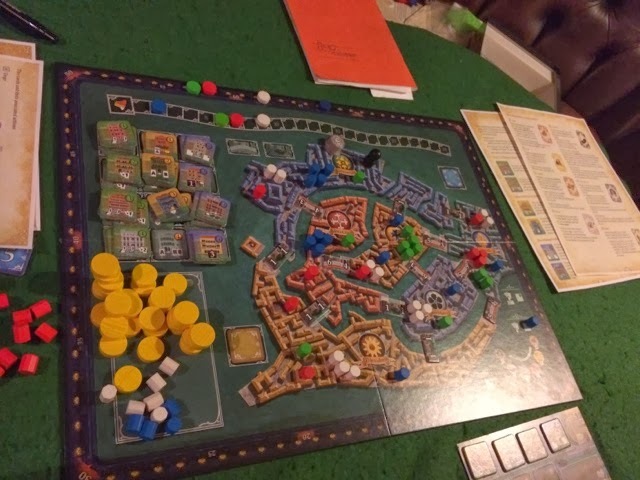 By three quarters of the way through the game Andy had laid three rails, but had collected masses of end game points with many skyscrapers, having focussed on high scoring trains and cards to let him cycle the deck quickly. When the scores were counted up, the main surprise having seen Andy gather up all the high pointers, was that he didn’t win by more. He demonstrated perfectly how to win while not laying too many rails on the board. Final Scores; Andy – 58, Paul – 49, Philip – 47, Neil – 46. Tom and Jon had been keen to play this with some of the expansions, and roped newbies Amanda and Gareth in for the ride too. Dan was also lined up, but following his opening bid, James turned up and Dan saw an opportunity for some 2-player action that would be a little more up his street - and so slid quietly away from the Civ-builders. This game was played with the sea expansion tiles, and an extra building / land tile each round (which gives a few more options, and less chance of being totally shut out of an auction). Amanda had a starting civilisation which gave her 2 population each round, which combined with her population-heavy tiles, was giving her a big income each round. Unfortunately, having to feed this mass of people proved difficult, and she saw a number if them die during the course of the game. Jon was shut out of an early auction, and found himself playing catch-up from then on. He managed to avoid the plague, and was managing to feed his population as required, but was finding that his (lack of) tiles were not worth many points. Tom's buildings were profitable for him, and the purchase of a sea tile also helped, but he was sometimes short of cash, and ended up with only 7 population. Anyway, the game drew to a close with Jon purchasing a sea tile in the final round in an attempt to boost his buildings total. Amanda also purchased a sea tile (her second), which had Tom muttering bad words under his breath. The plague took out 5 of her population, but she still ended with a healthy 10 people. Gareth had not quite foreseen the final supply round occurring quite so quickly after the previous one, and was unable to feed all his population. And so, newbie Amanda produced the most balanced civilisation, scoring an excellent 30 points to comfortably win a high-scoring game. Final Scores; Amanda - 30 pop (31 build), Jon 25 build - (30 pop), Tom - 21 pop (32 build), Gareth - 18 pop (28 build). My fave game of last year. I’m not very good at it but always enjoy the choices and selections you get forced to take. Anyway, first time outing for Gareth, and Paul and Tom had played once before each. We put Gareth in charge of shuffling and dealing out cards although he had a few problems counting to six, as some wit put it, ‘well, he does only have five fingers’. Mm, indeed. Tom, reminding us how well he’d done first time out, went for his ‘delay the vote’ building, and indeed used it to good effect. In fact all the others collected a good number of buildings which give a solid victory point total at game’s end. I decided not to this time and I was probably wrong in that strategy! I managed to get the majority in three areas by game end although points totals weren’t high enough, I hadn’t won enough of the ‘bridge’ or ‘gondola’ cards to capitalise. Indeed, Tom picked up these brilliantly to collect both 5 VP bonuses. 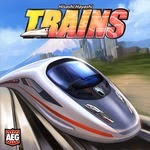 The Doge track was more influential this game than I think it has been in my previous plays. I started out well on it but then Paul took charge only for Gareth to sneak up on him, and then, just because of the way the cards fell in the last round I had no option but to take control of it at the end. Tom kept out of everyone’s way. Despite picking up some useful VPs during the game through bridges I was overtaken by Tom in the final round and he was clear. Paul and Gareth made up quite a gap on both of us with some useful building and area 2nd/3rd place points to make the final scores pretty close. Final Scores; Tom – 67, Neil – 62, Gareth II – 58, Paul – 57. 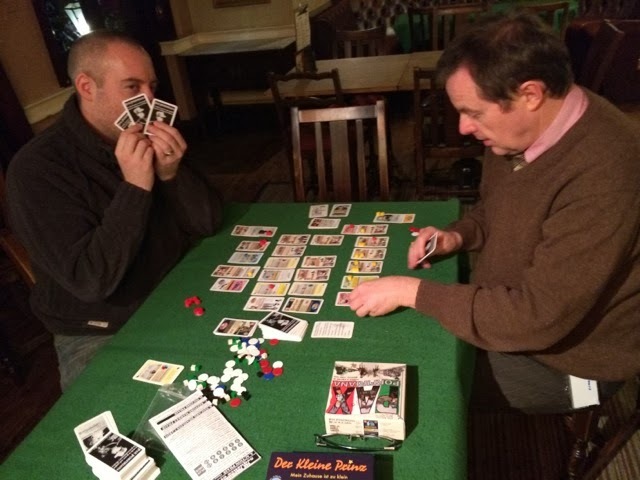 It's been 3 months since this game hit the table at IBG, but with Andy bringing it along tonight, he quickly found a couple of other willing participants in Philip and Jon. And with 3 players, the Mexico map is perfect. Phil won the start player auction, and set up the first link in the north, at El Paso. Andy took the polar opposite position, and built between Veracruz and Salina Cruz. Jon had been perusing the cards, and picked the one that allowed him to place a locomotive on another player's track, and claim a point every time it was used. To Phil's annoyance, he chose Phil's track, which looked like it was going to get plenty of use early on. 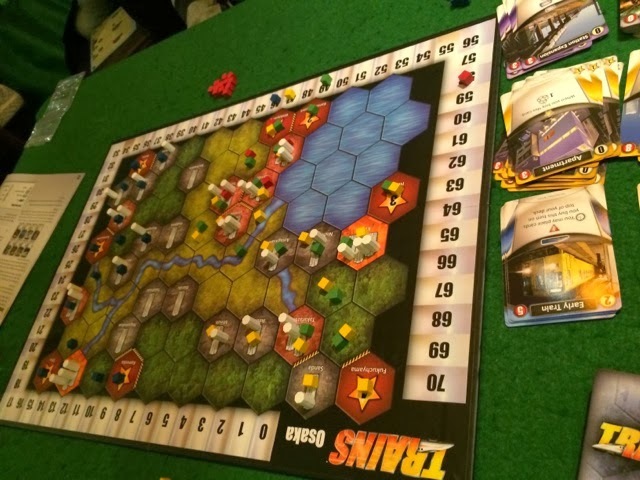 Jon's second and third turns were also used to pick up cards, including a Mexico City hotel, leaving him in the strange position of not having built any track (or taken any loans) at the end of round one, but having scored a point. Jon then decided to actually build some track, and started up in the north-east at San Antonio. Phil decided to circumvent Jon's 'leeching' tactic, and built a second link to El Paso, taking out more loans in the process (Jon was certain that it wasn't legal to build the same link twice, but couldn't find it in the rules and it turns out that it is legal - sorry Phil! Asking Tom and Neil at the other table wasn't helpful either. "Who is Phil trying to screw?" they asked. "Jon" came the reply. "Then it's legal!!!") Phil then took revenge on Jon and also built the same link into San Antonio, to try to steal some of Jon's blue cubes (although he claimed that it was only to get a single blue cube to earn the 4 point bonus for delivering 4 different colours...) Meanwhile, Andy was happily building all alone in the South - until Jon decided to build into Salina Cruz for the newly revealed service bounty. Phil had now left Jon alone and was starting to build down the west coast. Andy was also heading west, delivering some red cubes to Mexico City in the process (which Jon appreciated, due to his hotel) and picking up the bonus for the first 3 link delivery. Jon was heading down the east coast, upgrading his engine to level 2 in the process to continue to increase his income. By the mid-game, it was quite tight, although Phil was lagging a little and also had more loans than the other 2 players. All the major lines were completed, with Jon picking up a handy 12 points for the east coast and Mexico City-Torreon routes, and Andy and Phil picking up one each. Jon's east coast network had a number of handy 3-point deliveries, and another service bounty (to Brownsville) helped him start to pull ahead. The cities were starting to empty of cubes, and with Jon's lead, it was to his advantage to end the game as quickly as possible. This he duly did, delivering the last cube from Tampico, and although Andy had upgraded to a level 4 engine, he did not have enough available deliveries (or time) to make this advantage count. Phil had run out of worthwhile cubes, and needed to build more track in the final round to maximise his score. However, the number of loans he had taken reduced his score, leaving him in last place, with Andy taking a comfortable second. 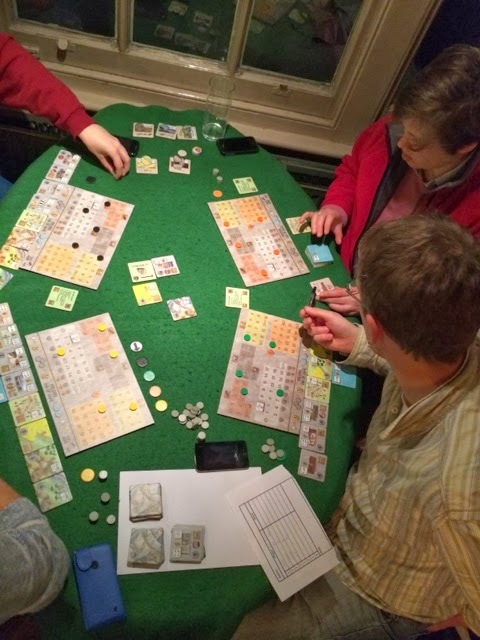 All in all, another great game of this classic, with the Mexico map proving to be tight but very interesting for 3 players. Let's not leave it another 3 months eh?! Final Scores; Jon - 50, Andy - 41, Phil - 29. So my romantic quiet rendezvous with Dan was spoilt by the presence of a dozen other interlopers at the pub... a disturbing collecting of bald heads, beards and bumfluff. Still not to let that disturb us we managed to sneak away to find time for a few games, as well as allowing Amanda into our reverie to protect her from the horrors of an otherwise train filled evening. First up Excape, a game of dice and luck, and luck and dice... and well mostly luck... but with dice. We played, I won, but I'm not sure quite what we were doing other than rolling dice to be honest... 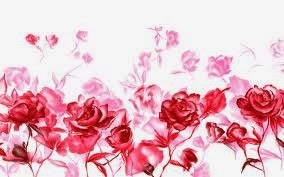 Still good to try something new! Next up was a revisit of Pickomino which I've taken a shine to so keep trying to get on the table whenever I can... having not won yet I thought my luck might be in this week... Dan seemed to get off to a hesitant start while Amanda picked up a few decent scores, quickly realising the main fun of the game was in taking tiles from other players, and proving deceptively good at it! I was feeling like nothing was really going, but seemed to be ok and in with a shout by mid-way... it was around this stage that I think Dan managed to switch in some loaded dice for his rolls as he started building a pile of tiles to dwarf the rest of us... and thus, despite the best ganging up efforts of Amanda and I, we couldn't seem to topple Mt Dan and I think at the end he had something like 7 tiles while we had none left. I'm not sure how he was switching in those loaded dice, but it's something to watch out for next time. Amanda could sense she was becoming an unwelcome extra in Dan and my evening so bade the party farewell, leaving Dan and me to head to Jaipur and savour the eastern delights therein. Great little two player card game, and Dan picked it up quickly beating me comprehensively in the first round... before I remembered to mention to him it was a best of three game... oops... Game two was more successful for me, and then, despite game three being the closest, I was able to clinch the overall victory. So a different kind of evening for both of us... several small games and a shared collection of victories. We didn't fall out once as well, which is good for Dan and me, and after such a pleasant evening I wasn't surprised when I got home to find that he'd managed to slip his phone number into my wallet... I guess another display of those dice dealing skills he was showing earlier.